AN enormous floating island of debris from Japan's 2011 tsunami is drifting towards the coast of America, bringing with it over one million tonnes of junk that would cover an area the size of Texas. The most concentrated stretch - dubbed the "toxic monster" by Fox News - is currently around 1,700 miles off the coast, sitting between Hawaii and California, but several million tonnes of additional debris remains scattered across the Pacific. Among the numerous items consumed by the trash island are boats, houses, electrical appliances and consumer products - all dragged away from the coast of northern Japan in the aftermath of March 2011's devastating tsunami. The latest statistics come from a report last week by the US Department of Commerce's National Oceanic and Atmospheric Administration. The NOAA commissioned the report in an effort to predict exactly when and where the giant floating junkyard would make landfall. The results suggest the movement of the debris remains wildly unpredictable, with experts forecasting the bulk of the rubbish could wash-up anywhere between Alaska and Hawaii at any point in the next few years. 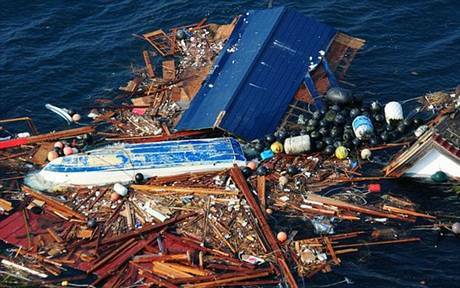 Some of the debris may have already crossed the Atlantic, however, with reports of Japanese fishing vessels washing up on the shores of Canada as long ago as winter 2011. If that proves to be the case, the levels of toxic junk already littering US beaches is likely to be high. The Japanese Ministry of Environment estimates around five million tonnes of rubbish left the coast of Japan in the aftermath of the tsunami, but says it believes only 30% floated out into the wider Pacific. The rest, the Ministry claims, sunk to the ocean floor around Japan.